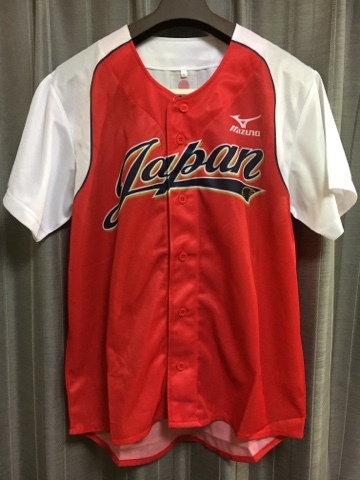 The Carp are probably the most popular team overall in Japan. Sure, the Giants are more famous, but Carp fans are amazingly devoted and can be found all over the country. So Carp sets are pretty common - there are several box sets issued every year. But this is the main team set that BBM issues, so what's in it this year? Here are the base cards. I really do enjoy BBM's team set designs; simple, clean, and unobtrusive in most cases. The Titlist subset features players who won awards the past year. The back lists other Carp members who won that award - Kenta Maeda is shown from 2010 and 2015. The Brightest Hope subset has some of the better players on the team with some previous-year highlights and comparative statistics. Oddly enough, there is a base set partial parallel which is serial-numbered to 100 copies. I believe the Carp are the first team to get a paralleled base set this year. Moving on to inserts, all of the regular Carp inserts you'll see below come in parallels of 100, 75, and 50 copies. The 100 parallels really aren't different other than the serial number, while 75 and 50 have patterned holographic/refractive backgrounds instead of just foil backgrounds. If you didn't guess that Quality Start has the team's top starting pitchers, you guessed wrong. Fighting Spirit has no real meaning, other than perhaps the players who appear to show the greatest effort on the field? What does that say about the other players? Fame of Carp has the famous Carp members. Mmmhmmm. Matured has, um, mature players. As you can see, the insert sets are the run-of-the-mill foil-covered nonsense that BBM always issues. There's also a Phantom insert set, numbered to 25 copies. This is a limited, super-shiny card set that's being included in all the team sets this year. I've seen a couple on YJA, but I don't have one yet. The Carp set includes the usual autographs for the whole team, along with the standard combo autographs, silver and 1/1 gold version autographs, and rookie autographs. Furthermore, the Carp set also has a memorabilia set including a patch parallel. I've been pushing hard to complete my collecting goals for the year. I'm about 35% done, with several not far from completion either. One of those unfinished goals is reducing the number of Japanese sets I want. I've found cards for several sets over the past few months, but one set that remained completely elusive - other than buying the entire set as singles - was the first Dancing Heroine set. If you've been living under a rock for the past five years, let me clue you in. Dancing Heroine is BBM's annual set showcasing the cheerleaders in the NPB. Yes, it's basically eye candy, but it sells well. It's so popular that BBM has been issuing two series each year and even released some team-specific box sets. When I first came to Japan, I probably could have found the 2011 set somewhere, but I never knew to look. Now, full sets almost never show up in auctions, and I've never seen one in stores. Last month, someone listed a couple opened boxes on YJA, and I jumped at the opportunity. I ended up getting pretty close to a full set with only a few duplicates, as well as the three autographed cards you see here. You may or may not be able to tell from my scans, but the image quality in the 2011 set is pretty poor - the photos look grainy or off-color a bit. Another aspect of the 2011 set that was changed was the use of regular base cards for the autographs - the foil numbering on the back (aside from the sticker for the autograph, of course) is the only indication that these are authentic. The 2011 set was the largest, and this may be why BBM has released two sets each year since then - the full squad for each team can get cards and autographs and each set is under 100 cards. With a little bit of searching a couple weeks ago, I found all the cards I needed to complete the set. So this one is in the bag! Do you love music and trading cards? Do you remember collecting CDs or record albums, and all the space those awesome covers took up? Well, do I have the product for you! I don't know much about these, other than the only ones I've seen are what I'm sharing with you. Yui is/was a Japanese musician who got her start in 2004. She retired in 2012, but returned the next year before eventually getting married and having kids - that was a couple years ago, so she seems to be on extended hiatus or fully retired at this point. .These are a little smaller than standard sized cards across and are square shaped. The card stock is thicker, too. The fronts have the images found on the CD covers. Backs give various details - what album or single it is, the release number, and title is at the top. The release date is followed by a track listing and some Japanese text that gives the smallest bit of information about the release. A "Yui" logo, "Jacket Trading Card" and the copyright is at the bottom. As you can see here, multiple covers get multiple cards - Namidairo has two identical releases other than the front image and release number. I've never heard Yui's music, but when I saw these little cards I had to pick them up. As I mentioned, a very quick search didn't turn up anything other than Yui having these cards, so it could have been some kind of campaign. I don't know anything about how or exactly when they were issued, though my "newest" card has a 2010 release date, so they're no more than 7 years old. I love this concept. The size isn't convenient for storage, but since they aren't much narrower than standard cards they'll fit well into card boxes. I would totally collect these for a lot of my favorite artists - everyone from Queen, The Beatles, Michael Jackson, and Madonna, to Avril Lavigne, Ben Folds, and Britney Spears. And in this day of digital music, having a cool card "album cover" for Taylor Swift and other modern artists would be awesome. I've shown a Calbee pack before, but as I mentioned then, I had another sitting around. So, what was inside? Luis Mendoza's line is better than the Mendoza Line. Though he's a pitcher. He has a losing record over his career here in Japan, though he has a relatively respectable ERA (3.78 career in the NPB to date). Looking at his batting stats, in 14 plate appearances he's never reached base, striking out 10 times and grounding into a double play once. The second card is a Starcard, which is about as good as you could get, other than the foil signature version of them or maybe a Lucky Card. The player is Hisayoshi Chono, who last year batted .283 but is only at .224 this year. So there you have it. Two cards, two mediocre players. But wasn't that fun anyway? Yes, it's been a long time. It's been two weeks since my last post, again not due to a lack of interest or psoting material, but due to a lack of time and other projects. Actually, I was getting sick as I was writing my last post, and that cold knocked me out for several days. I'm still trying to recover, stuck around 95%. This past week, I've been working on a project that has nothing to do with baseball, so I won't bore you with the details. I finally finished that a couple hours ago. Meanwhile, I've picked up some great stuff off Yahoo Japan Auctions and new cards at the shops, so you'll see those soon. Today starts with tomorrow, for tomorrow, I will finally go to Tokyo Disneyland for the first time. Yes, I've lived in Japan for five years, and have not been to TDR (Tokyo Disney Resort). Yes, I'm a theme park junky and a Disney fan, and have not been to TDR. Yes, I went to Hong Kong Disneyland a couple years ago, but have not yet been to TDR. The real reason for that is crowds. The Tokyo park is probably the most consistently crowded. Lots of people visit the park at least once a year, and many have annual passes - which run about $500 each. Seriously, don't go to TDR on the weekend - wait times are consistently in the hours. Pass holders will go with friends and chat and ride one or two rides in a day, watch a show, and grab some food. So I've been waiting for a good weekday, and between weather, money, and energy, there just hasn't been a good opportunity. But over the past few months, I've worked a shifted schedule where I have Mondays and Tuesdays off, and Tuesdays are much better days to visit. June is a good month, too, though even on a Monday - a school day Monday - Big Thunder Mountain and Splash Mountain had over two hour waits this afternoon. I'm going tomorrow, a Tuesday. Crowds should be lighter, but I'm still planning on long lines for the popular attractions. So I planned out my day - I made an itinerary to help me get the most important attractions as quickly as possible in the morning. People in Japan start their day early, too - the park opens at 8 AM every day and admission lines get long well before that. You can buy tickets at the park in the morning, but that's another line to wait in. You can buy tickets at convenience stores, but it looks like they need to be exchanged for regular tickets before going into the park. And you can buy online, but they need to be printed - I could do that but printed tickets wear out pretty fast. But then there's the Disney Store. And there's a Disney Store about a 30-minute walk from here. Not having left my apartment and the one-block surrounding area (I love that I can walk to a grocery store and 24-hour convenience store both in 5 minutes) I figured it'd be a great way to get some exercise. Yeah, that's a Japan jersey. It's not an "authentic" jersey - it's like the fan jerseys worn at NPB games. 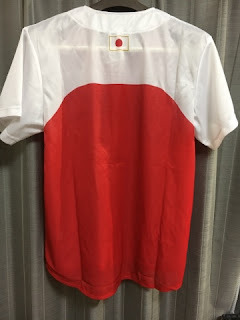 That said, the design is similar to one of the jerseys the national team has worn. And it fits - not terribly well (I need to lose my Homer Simpson stomach) but I'm glad it's wearable. That shop has a good stock of Marines and Giants fan jerseys, and occasionally other jerseys too. I've also found a few baseball souvenirs there but the good stuff is overpriced. I didn't strike out at the second shop, but you'll have to wait to see that til later.